It’s been a rough few days around the house, My Dad’s Funeral was yesterday. There was quite a few more people than what we expected, we were very pleased for all the people that attended. A lot of old neighbors from the 2 different places we lived and old co-workers that worked with Dad and myself showed up. We had a small Wake for the family at our Church afterwards. Me and Mom are so sad and miss him so much but he was suffering so bad, and now he is at peace. Love you Dad!For Dinner tonight, more of an appetizer – Shrimp, Scoops, Salsa, and Sour Cream. Just not in the mood to put a lot of effort into cooking tonight. I wanted something light and easy to prepare for Dinner tonight and it doesn’t get much easier than tonight’s Dinner of Shrimp, Scoops, Salsa, and Sour Cream. I used Meijer Cooked Shrimp, Tostitos Whole Grain Scoops, Newman’s Own Black Bean and Corn Salsa, Daisy Light Sour Cream, and a sprinkle of Sargento 4 Cheese Mexican Shredded Cheese. I’ll have this for Lunch from time to time, so why not Dinner! I love using the Black Bean and Corn Salsa for dipping with the Cooked Shrimp, perfect together. To assemble the Dish is easy. The Shrimp was frozen so I let the Shrimp thaw overnight in the fridge. You can use a bowl or plate for everything. Put down the Shrimp, a serving of the Scoops, 3 tablespoons of the Salsa, a tablespoon of the Sour Cream, and you can add a sprinkle of the Shredded 4 Cheese over the Scoops. Then dig in! Light and easy to prepare, and little clean up. This makes a great Light Meal!For Dessert/Snack later a bowl of Skinny Pop – Pop Corn with a Diet Peach Snapple to drink. Pep up your nachos or tacos using Newman’s Own Black Bean and Corn Salsa. This can be added to a variety of snacks to bring out the taste. The medium salsa can be used in pasta for flavoring or spread generously on a pizza for a spicy touch. It is infused with the goodness of black beans and corn.Newman’s Own- Black Bean & Corn Medium Salsa, 16 Oz: So good it oughta be outlawed! Dreary and rainy day today, and turning cooler! A while back I had ordered a 16 oz. 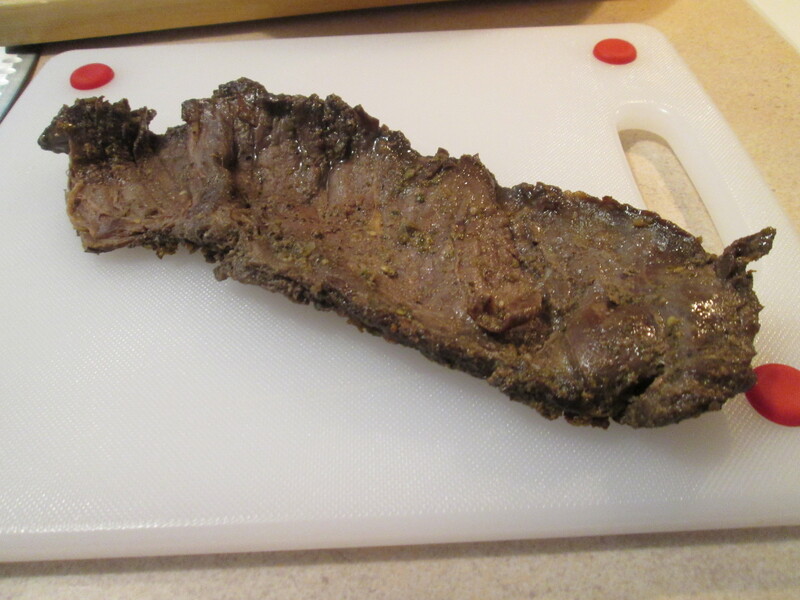 Cilantro Lime Skirt Steak from Wild Idea Buffalo and I’ve finally got around to prepare it. 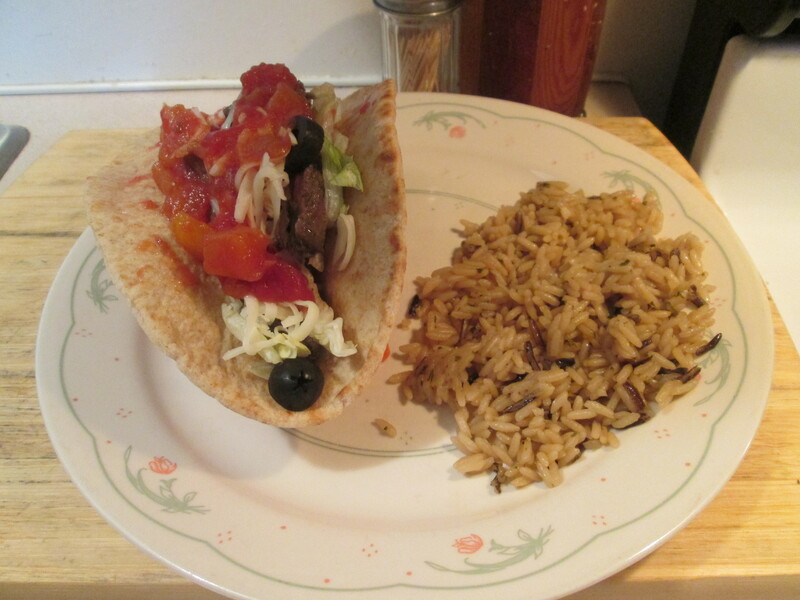 For dinner tonight a Cilantro Lime Buffalo Skirt Steak Pita Bread Wrap w/ Long Grain and Wild Rice. First time I’ve used the Wild Idea Buffalo Cilantro Lime Skirt Steak. It’s a 16 oz. Skirt Steak and it comes marinated in a Cilantro Lime Marinade that’s made up with Tomatillo, Lime Juice, Cilantro, Garlic, Olive Oil, Salt, Cumin, Cardamon, Cayenne Pepper, and Black Pepper. Which all combines into one fine Marinade. it was sliced thin into several pieces. I pan fried it in Extar Virgin Olive Oil and seasoned with a couple of shakes of Sea Salt and Ground Black Pepper. Being cut so thin it fried up really quick, about 2 or 3 minutes per side. It really browned up nice and the flavor was incredible! 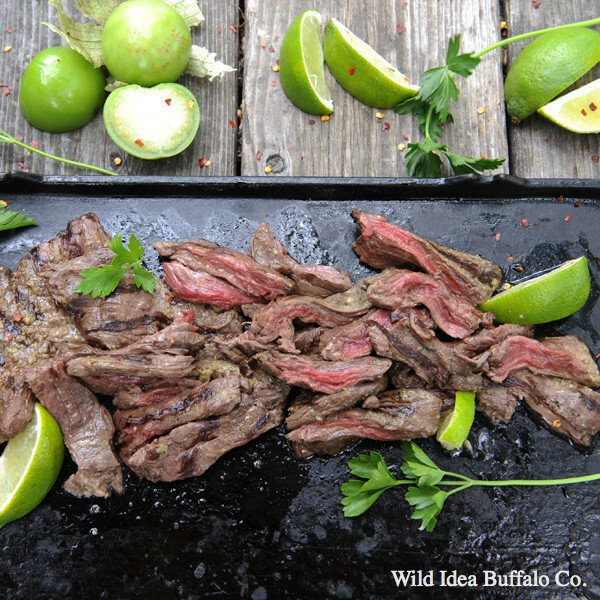 The Marinade is a perfect one from Wild Idea Buffalo. After it was done I then sliced it into thin strips for the Pita Bread. 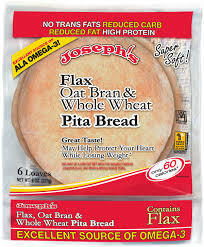 I used Joseph’s Flax Oat Bran and Whole Wheat Pita Bread, my favorite by far with 60 calories and 4 net carbs. 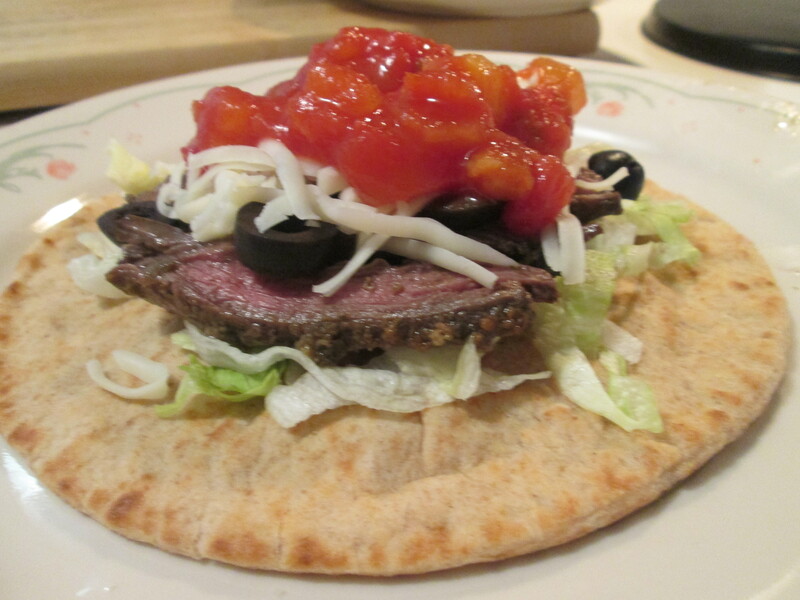 To assemble, besides my Cilantro and Lime Skirt Steak, I used Shredded Lettuce, fresh grated Monterey Jack Cheese, Sliced Black Olives, and a Freestone Peach and Mango Salsa. The Salsa was a Kroger Brand Private Selection, 20 calories and 4 carbs. Layered everything on the Pita Bread, which I folded into a Wrap. To go with the Wrap I heated a bag of Uncle Ben’s Long Grain and Wild Ready Rice. For dessert later a Healthy Choice Chocolate Swirl Frozen Yogurt. “Two thumbs up on the Cilantro Lime Skirt Steaks! I am happy to report you have another winner on your hands,” Kim Eslinger, editor of Mill City Times. A real fiesta of flavors. The cilantro lime skirt steak is perfect for grilling up some buffalo fajitas, or equally delicious on its own. Ole! 1 lb. 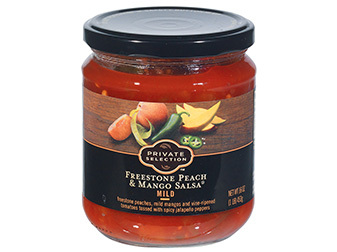 Private Selection™ Freestone Peach & Mango Salsa is handcrafted in individual batches, then cooked in small kettles for a delicious texture. Serve Private Selection Freestone Peach & Mango Salsa with grilled mahi mahi fish tacos for a flavorful meal. 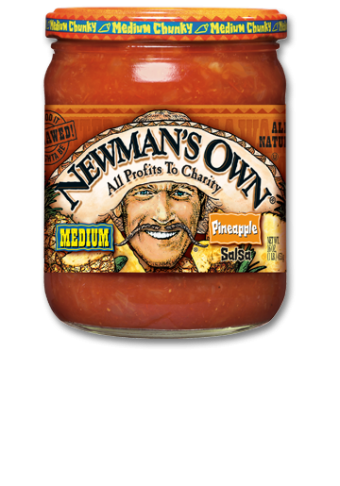 Wow I tried Newman’s Own Pineapple Salsa for the first time and I’m going to have to make room for another Salsa! 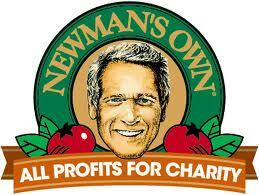 My favorite is still Newman’s Own Black Bean and Corn Salsa but the Pineapple is awfully close! It’s a completely different Salsa than the Black Bean and Corn. It’s got a little heat from the Jalapenos and then you have the sweetness from the Pineapple, it ends up a perfect match for a Salsa. This would go good over your Eggs at Breakfast or at dinner for a topping for your Baked Potato. I’ll be adding this to the Pantry Stock for sure. Serv. Size2 Tbsp (32g)Calories15Calories from fat0Total fat0gSaturated fat0gTrans fat0g Cholesterol0mgSodium90mg (4% DV)Total Carbohydrate3g (1% DV)Dietary Fiber<1g (4% DV)Sugars3gProtein0gVitamin A(15% DV)Vitamin C(0% DV)Calcium(0% DV)Iron0g (0% DV) Percent Daily Values (DV) are based on a 2,000 calorie diet. In a mixing bowl, combine the avocado, mango, jalapeño pepper, jicama, and lime juice. A perfect day outside and fired the grill up! i grilled Miller Amish Boneless Chicken Breast with a Heinz 57 Sauce/Honey Glaze. You think it sounds good, it tastes even better! Grilled the Breasts about 30 minutes and after flipping the Breasts after 15 minutes brushed the Glaze on with about 10 minutes left. The Glaze recipe is just two ingredients, Honey and Heinz 57 Sauce (the recipe is at the nd of the post). 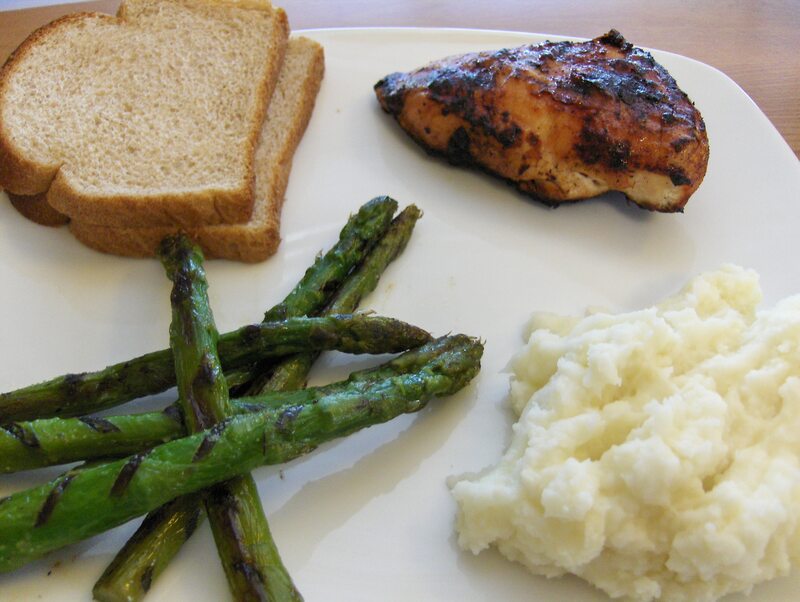 Along with the Chicken I had sides of Grilled Asparagus Spears and Idahoan Homestyle Mashed Potatoes along with Healthy Life Whole Grain Bread. The Sauce really set the Chicken off, give it a try. For dessert/snack later some Fiesta Salsa along with Chip‘ins Pop Corn Chips. Made a Ground Turkey Pattie using Honeysuckle White 93/7 Ground Turkey. Seasoned it with McCormick Grinder Sea Salt, McCormick Grinder Black Peppercorn, and Ground Smoked Cumin and fried in Extra Virgin Olive Oil. 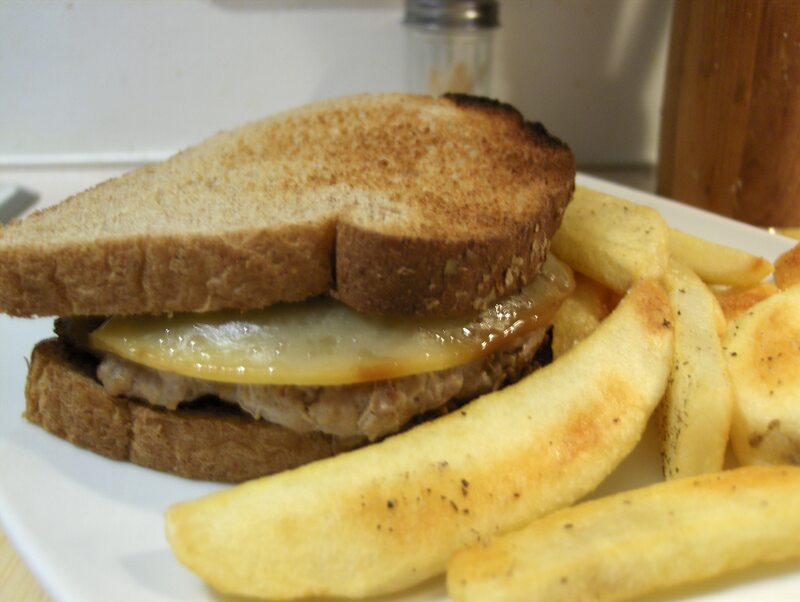 Topped it with Smoked Gouda Cheese and served on Healthy Life Whole Grain Bread. Had Ore Ida Baked Steak Fries as a side. For a dessert/snack later some Chip‘ins Pop Corn Chips along with Kroger Naturally Preferred Black Bean and Corn Organic Salsa. 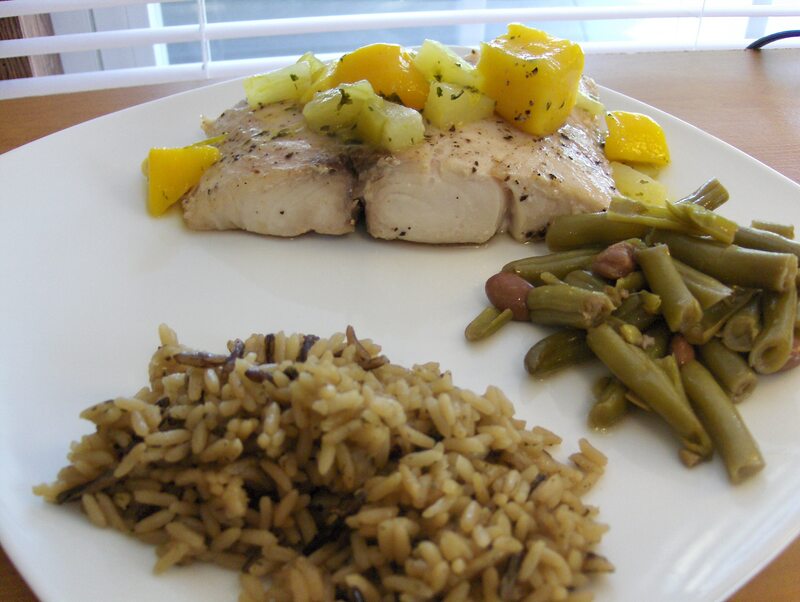 Broiled Mahi Mahi w/ Long Grain and Wild Rice, Mango/Pineapple Salsa , and..
What a dinner! I bought a huge Mahi Mahi fillet and cut it into three fillets for myself and my Mom and Dad. I seasoned the fillets with Sea Salt and Pepper and drizzled them with Extra Virgin Olive Oil. I broiled the fillets for 5 minutes per side. They turned out perfect! I used Uncle Ben’s Long Grain and Wild Rice. At the end of the post I’ll leave the Mango/Pineapple Salsa recipe and instructions. A really easy and tasty recipe that goes great with Seafood or Pork recipes. The Green Beans were leftover from last night’s dinner and I also had Healthy life Whole Grain Bread. Dessert later tonight a cup of Jello Sugar Free Chocolate Pudding topped with Cool Whip Free. * This goes good over a Sugar Free Angel Food Cake also. I made and had Shrimp Tacos for the first time, and this will not be the last time! They turned out fantastic! T he Shrimp was tasty and cooked just right and all the seasoning and ingredients came together just right. Too good! * Preheat, medium heat, medium size skillet. Before heating spray pan using Pam Spray With Olive Oil. After pan has heated add Extra Virgin Olive Oil. * Add Shrimp and season with all the seasonings. Cook Shrimp 2 – 3 minutes per side. * Lay a leaf of the Lettuce on each Tortilla then add Shrimp on the Lettuce, 3 Shrimp per Tortilla. * Add your toppings, to taste. Salsa, Sour Cream, and Mozzarella Cheese. Fold the tortilla your favorite way or leave open face.